Cambridge College has become a go-to school for single mothers, minorities, and immigrants. Leading its expansion is a man who knows a little something about fighting for what's right. It took Mahesh Sharma more than three decades after he first settled here to raise his right hand and swear official allegiance to the United States of America. It's not that he didn't want to become a citizen. The native of Rajasthan, India, had long been here to stay. But Sharma's father had fought for Indian independence in the 1940s, and Sharma couldn't bring himself to take up US citizenship as long as his father was alive. His father died four years ago, and Sharma, now 64, was naturalized in November. But his belated embrace of US citizenship was prompted by more than his father's passing. As the president of Cambridge College -- a school that serves large numbers of single mothers, African-Americans, and immigrants (legal and otherwise) -- Sharma often finds himself in the midst of hardening battles over race, class, and immigration. In these days of immigrant protests and rallies, running Cambridge College is a truly political proposition, and Sharma felt he couldn't take strong enough stands for his students unless he was a citizen. "As permanent residents, we are guests, and criticizing government policy or making political statements is really not part of that contract," he says. "I would not be as strong an advocate for the college if I was not a citizen." The college was founded in 1971 as the Institute for Open Education at Newton College of the Sacred Heart. Sharma began teaching there the following year. He had arrived here in 1968 as visiting faculty at MIT after graduating from Rajasthan University in Jaipur, India. In the beginning, the college had 100 students. It now makes its headquarters in a brown-brick building outside Harvard Square and serves a student population made up mostly of those marginalized by other four-year and graduate institutions. Sixty-eight percent of the students are women, and more than half of those head single-parent households. About 85 percent receive some kind of financial aid, and one-quarter of those earn incomes below $25,000. About 32 percent of the students are black, and 11 percent are Hispanic. 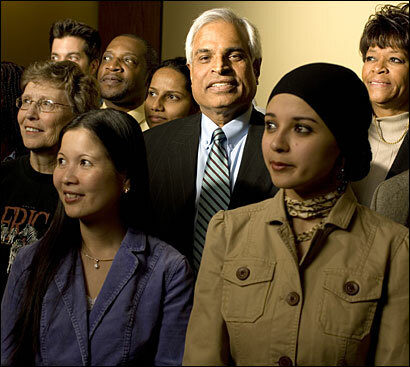 About 16 percent speak English as their second language. "It is a college of second chance for most people," Sharma says. "We give educations to a group who are either denied that opportunity, or could not afford it, or life was happening to them." The school serves 7,000 students combined, in Massachusetts and out of state. Its mission is to lubricate the social machinery by educating working adults who hope to move themselves up in life: giving master's degrees to boost their teacher's salaries or medical translation diplomas so they can earn $18 an hour in local hospitals, for example. There are classes every night of the week and on weekends. Sharma himself teaches math education on Sundays. The college has attracted some major benefactors; billionaire David Koch recently promised $1.5 million. But for a college without a hefty endowment, providing courses at $335 per credit requires a more entrepreneurial approach to education. Half of the college's main campus building is rented to commercial tenants, bringing in almost $1 million a year in scholarship money. When Sharma sees a new market for the school's services, he wants in. Since 2000, Cambridge College branches have opened in Augusta, Georgia; Chesapeake, Virginia; Ontario, California; and San Juan. In 2003, it opened a campus in Lawrence, delighting officials in the long-depressed Massachusetts city. Sharma is determined to grow the place into an international force. On recent trips, he was struck by how effectively colleges are training people in India and China, and he hopes to open campuses there. "A First World is developing in the midst of the Third World," he says. "And a Third World is developing in the midst of the First World. The skills gap in American society, compared to the skills development I just saw [in Asia], should alarm us." Yet, for some, Sharma's ambitious plans have raised questions about whether he is a better entrepreneur than educator. A Wall Street Journal article in his first year as president cast the college as a diploma mill for schoolteachers looking for a quick pay hike, with some instructors offering Mickey Mouse courses. "In some cases, faculty members did not require enough, and we have made amends to that," Sharma concedes. But he says the criticisms also come down to prejudice: "If you're working with poor people, people assume your standards must be low. It is a built-in bias in this society. It will take some time for us to wipe that bias out." This year, Cambridge College will offer an accredited doctoral program in education leadership that should bolster its academic bona fides and produce not only teachers but also leaders. "We are not on the periphery anymore," Sharma says. "We are at the center of that debate." Yvonne Abraham covers immigration issues for the Globe. E-mail her at abraham@globe.com.